Novak Djokovic believes he is peaking at the right time as he looks to return to past glories by challenging for the title at Wimbledon. The former world number one reached the last four of a grand slam for the first time since the 2016 US Open by battling his way past Kei Nishikori at the All England Club on Wednesday. 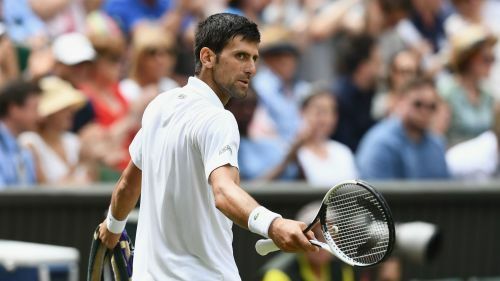 And Djokovic, a three-time champion at SW19, is in confident mood as he prepares for a clash with either Rafael Nadal or Juan Martin del Potro on Friday. "It feels great to be in the last four of a slam," he said. "I've been building the last couple of weeks on the level of tennis I've played in the last couple of months. "It felt like it was getting better and better as matches and time went on. I feel like I'm peaking at the right time. "It's not the first time in the semi-finals - I've been here before - but first I'll try to enjoy this victory before thinking about the next opponent." Asked if he is a genuine contender this year, Djokovic replied: "That's why I'm here. "I'm very grateful that I have the opportunity to play the sport that I love at this high level and I've worked very hard to get myself in the best possible shape for the biggest events. "It doesn't get any bigger than Wimbledon, so hopefully I can keep on going." Djokovic argued with the chair umpire as he was given warnings for racket abuse and delays between serves, but the Serbian explained his side of the argument in the aftermath of the four-set triumph. "I thought it was unnecessary to get the warning. I didn't harm the grass," he said. "I know how I threw the racket, but [Nishikori] threw a racket in the fourth set and the umpire said he didn't see it. I get the warning, he doesn't, so it's not fair. "It is what it is. With the emotions of a tough match, it happens."